These tasty little numbers are handy to make in advance if you want an even quicker supper. 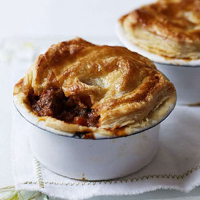 Simply prepare the beef filling and keep in the fridge, then add the pastry toppings when ready to bake. Trim the steaks, cut into thin strips and place in a bowl. Season and add the paprika; toss to coat. Heat a frying pan over a high heat. Add 1 tbsp oil and a handful of steak strips. As soon as the strips are sealed, remove them to a warm plate. Cook the rest in batches, adding extra oil as needed, until all the meat is sealed. Melt the butter in the pan. Add the onion; cook until soft. Add the garlic, mushrooms and thyme; cook for 4 minutes. Then add the tomato purée; cook for 1 minute. Return the meat to the pan; add the mustard. Take off the heat and stir in the crème fraîche. Preheat the oven to 220C/gas 7. Use a large ramekin or saucer to cut out 4 rounds of pastry; cut a hole in the middle of each one. Spoon the beef filling into the ramekins. Mix the egg yolk with 1 tbsp water and use to wet the edges of the ramekins, then press the rounds on. Brush the pastry with more of the wash; bake for about 20 minutes, until the pastry is golden brown.